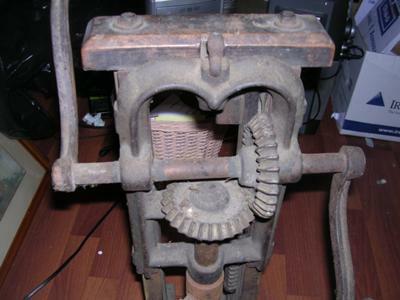 This is an early double handled drill press. A latch at the top of the drill press is released and the drill press is allowed to travel down the support track (pictured in the back right hand side of the press as you're viewing it). It is approximately 24" High, 28" Long and 7" Wide (excluding the handles). There is no manufacturer mark either on the metal drill press or on it's wooden support stand. This is one of the earliest Miller Falls beam boring machines. Later ones had two sets of 5/8 inch rods that were hinged to the base...thus allowing the drill to be set at various angles. Later ones had an additional rack-and-pinion gear mechanism to help raise and lower the blade. The cranking gear mechanism is the same in this one as in later models. Bits were held in place with a square headed set screw mating a dimple in the bit, and the chuck has a dovetailed key set into its side to help drive the bit. Great machine. This type of drill is usually called a Boring Machine, or Beam Boring Machine. That is a very nice example. I believe yours is NOT a Snell, but I don't know who made it. What this was used for was to drill holes in beams. The beam was placed in between the opening that is seen at the back and thus was lined up for drilling with the hand cranked chuck. This is a very early model. Later models had an improvement that allowed the fixed drill & chuck to be set on an angle.